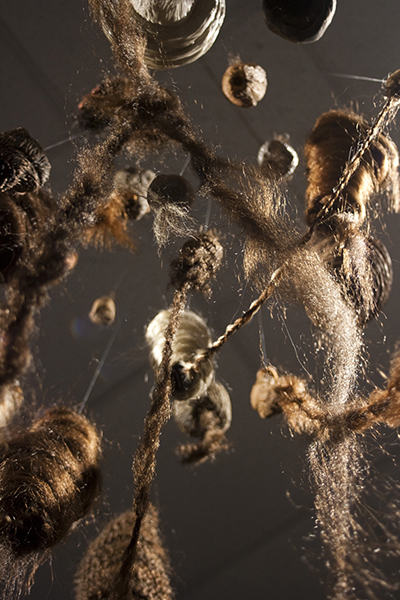 Colony is an installation of cocoon and nest-like structures crafted from hand-built ceramic forms and locks of hair that slowly multiply into a system of homes. This system, this community, becomes a mirror for both the nostalgia of my childhood and tight-knit family, as well as the unexplored and unfamiliar territory that is constantly pressing into my known world. The links created between the groups of nests reflect the connections one makes throughout his or her life. These connections surround us throughout life and provide a sense of security, shelter and warmth. The hair used is a combination of synthetic and human locks of hair collected from friends and family members. The wrapping, braiding and knotting the hair together symbolizes the familiar strength of a mother’s protection and brings to mind an iconic symbol of femininity. Simultaneously, the permanent detachment of hair from the human form transforms into strange alienated forms. I am interested in how something that was once a part of us is reinvented as a structural component of natural cocoons and nests. My work is ultimately about rebirth: how a material can be discarded and repurposed into homes, gatherings, and colonies.